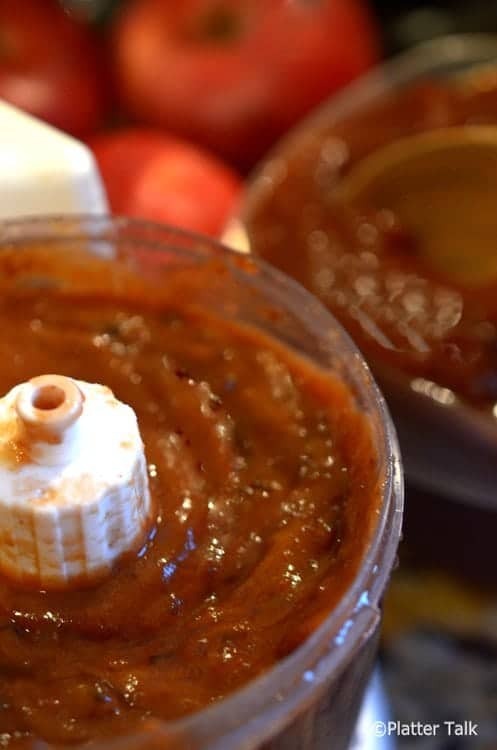 We’ve been doing a few recipes using apple butter lately. This season’s current run on recipes using the smooth and autumnal spread kicked into ultra high gear in the wake of our first batch of homemade apple butter. It’s the best I’ve ever tasted. This afternoon after one of those long and seemingly endless days at work, I came home and opted for a taste of our product. Just a dab, on a pita chip. When I opened the lid of the container, the aroma of the freshly made apple butter hit me with an unanticipated force. “I have to make something with this,” I said to myself. 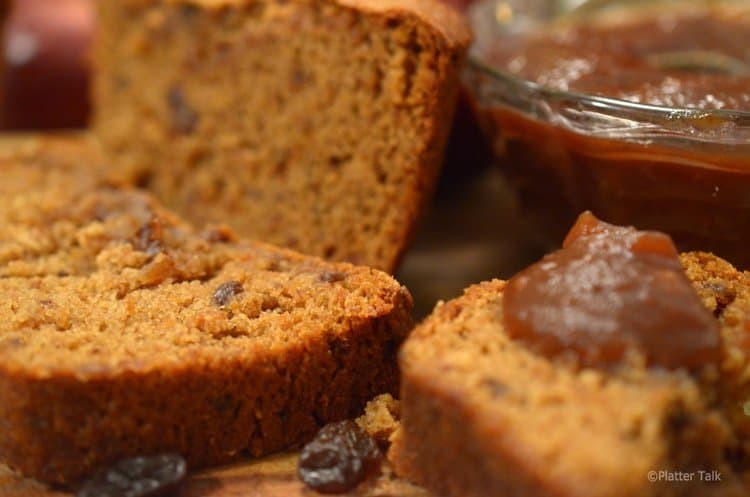 Enter, oven center: Raisin Apple Butter Bread. This warm and comforting taste of fall started on our lone honey crisp tree and ended up on our cutting board. Stops in between included a day or so in our slow cooker followed by a few days of being stored in our kitchen refrigerator. Grease a 8x4x2-inch loaf pan. Beat the butter and sugars with an electric mixer in a separate large bowl until smooth. Add the egg and continue beating until smooth. Add apple butter to raisin mixture and process for an additional minute. Fold apple butter and raisin mixtutre into egg, butter, and sugars mixture. Mix in the flour mixture until just incorporated. Bake in the preheated oven until a toothpick inserted into the center comes out clean, about an hour. 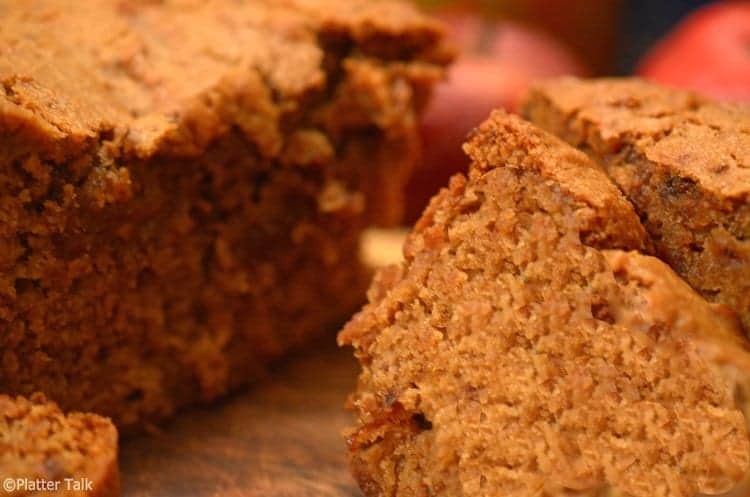 I have never had an apple bread before!! It looks delicious!! I love Fall!! We are right there with you, Marilyn! Thanks for the great comments, Donna. We are pretty excited about the arrival of autumn in our kitchen as well! 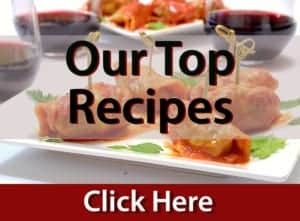 One can never have enough bread recipes!! I love this unique combination! Agreed, Suchi! Thanks for stopping by Platter Talk! I love apple butter! 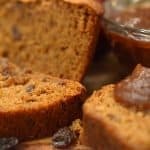 So I am pretty sure this raisin apple butter bread will be a WINNER with me! 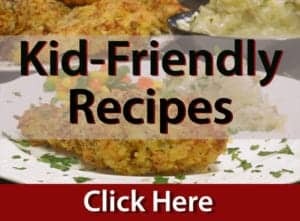 Cindy, we are so excited for fall and to make new dishes with one of our favorite condiments from the season. Thanks so much for dropping by Platter Talk. The bread looks so good, moist and filled with flavors. There’s nothing like fresh homemade bread. Bookmarking to try soon. Thanks so much Molly, I think you’ll enjoy this! Thanks for stopping by Platter Talk! I was given some apple butter recently and had no clue what to do with it – now I know – this bread sounds delicious! Thanks, Shashi! Alternatively, use it as a spread on pitas, toast, bread, roll, etc, etc. It’s so nice to hear from you and I hope you are staying warm! 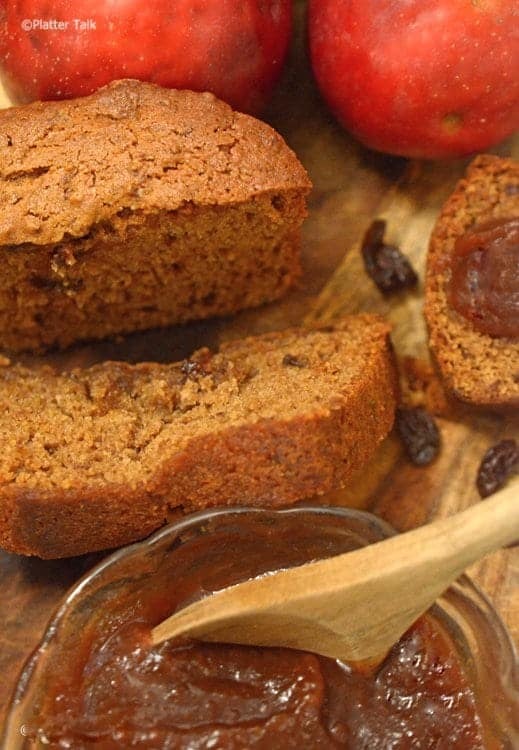 I KNOW I am in love without even trying it – APPLE BUTTER BREAD – YES!! Sounds great and looks delicious Dan. I’m already thinking what wonderful holiday gifts both your wonderful bread and apple butter would make! Beautiful photos as always!